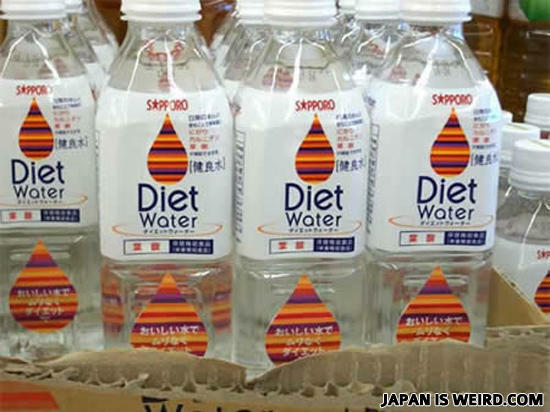 WTF, why don't we have diet water? No wonder why the world sees us as a fat country. Just wait until you see their next breakthrough product. Campers, hikers, even astronauts will love it. Its dehydrated water! Its so simple, all you do is add... Wait, what? Now with less calories than ever before!!! We actually do sell diet water. We even sell a flavor called Diet Ice. Diet water: now with -6 calories! Now available in caffeine free, too! Yeah, this is actually a lot like America's Vitamin Water or Life Water. The name just sounds funny in English. As you may know the Japanese don't try too hard with English translation lol. I bet they also have non-alcoholic vodka. The japanese part probably says something like "Don't tell the dumb americans its just plane water." What, they turned H2O to H1O? Low Fat Diet Water With only 50% of Water. Since drinking fat-free water I could never go back to drinking regular water! ... I bet it expires, too. This is what happens when there is too much Innovation in the world. That's nothing! I buy powdered water! It has all the benefits of diet water, all you do is just add.... ohhhhhhh..
Because regular water is just so fattening. "What, they turned H2O to H1O?" Wouldn't that make it HO?